This exercise is designed to help with your legato playing. 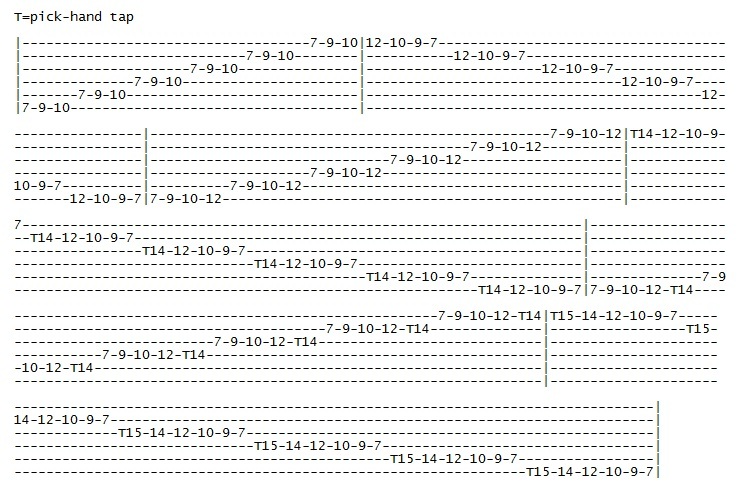 It sort of has a Rusty Cooley vibe to it (to see what I mean, check out his instructional DVD, Shred Guitar Manifesto). This exercise starts with a 3-note-per-string whole step-half step intervalic shape on each ascending string (which should be done with your 1st, 2nd, and 3rd fingers), but when you get to the high E string, you add a whole step with your 4th finger, then you descend strings with that 4-note-per-string shape you have on the high E string. After this section, you ascend up the strings with that 4-note-per-string (whole step-half step-whole step) shape and when you get to the high E, add a whole step with your pick-hand middle finger, then descend with that 5-note-per-string shape. When you start ascending with the 5-note-per-string shape, you don’t need to pick every string, just the first one because it’s probably harder to make the change from picking to tapping, especially when doing it lightning fast (not all of us are as good as Rusty Cooley, you know!) You can pick it if you like though. Anyways, when you get to high E, add a half step with your pick-hand ring finger, so you’ll be tapping with your pick-hand middle and ring fingers. Descend with the 6-note-per-string shape (whole-half-whole-whole-half). 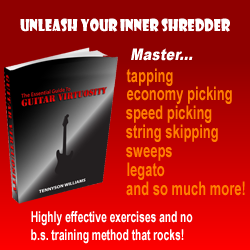 To fully master this exercise, you should be able to play it lightning fast and in every position on the fretboard. Have fun, and happy shredding!